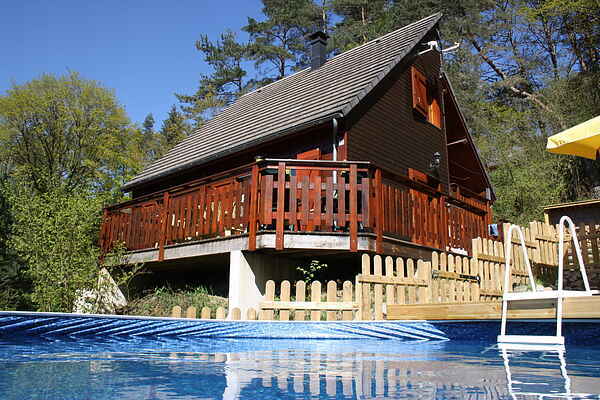 Atmospheric wooden chalet with private swimming pool and canoe, for some water fun on the close-by lake! The lake of Bort-les-Orgues lies within walking distance (0.5 km). Here you will find a sandy beach, and besides canoeing you can go for a lovely swim and a dive in the lake, and after that have lunch on the terrace near the swimming pool... This holiday home is part of a park with about 30 more holiday homes and chalets. So very cozy for the kids! The surroundings are characterized by lakes, old volcanoes, castles and churches. A wonderful environment to explore. Your holiday home lies at the edge of the impressive Parc Naturel des Volcans d'Auvergne. A paradise for hikers and nature lovers. Take the cable car to the Puy de Sancy (Auvergne's highest mountain: 1889 m) for a breathtaking view (45 km). Or take the train to the top of the Puy de Dome, France's most famous volcano (63 km). For daily groceries and a restaurant you can go to Beaulieu (3 km). In Lobre (5 km) you will find a bakery, supermarket, butcher and restaurant. For the large supermarket, visit Bort-les-Orgues (10 km). A perfect holiday home in the authentic green heart of France!